It appears that Sorby then abandoned this avenue of research, but he was always meticulous in preserving his microscopical preparations – sometimes publishing his results long after completion of the experimental work. For example, all his work on the microstructures of iron and steel were carried out during 1863–1865 but remained unpublished until 1886–1887. However, the preparations of the crystallisation experiments, upon which the 1879 paper is based, did not come to light until 2011 when one of us (RE) discovered, at the back of a store cupboard in the Department of Chemical Engineering at the University of Sheffield (UK), a cardboard box covered in blue-paper labelled ‘Chemical Precipitates &c’. Figure 1. 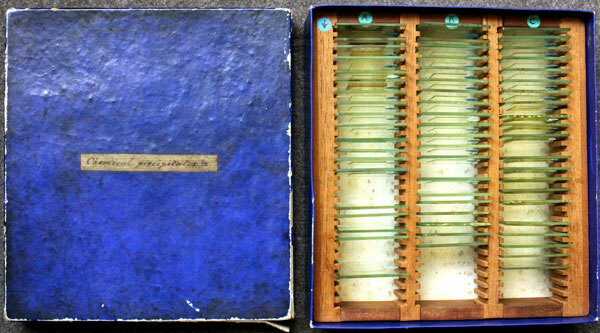 Sorby’s original cardboard slide box: 165 mm square by 48 mm deep with three rows of edge-mounted slides. The coloured discs were added by this paper’s authors. The box and its contents are shown in Figure 1. It contains sixty 40 mm square glass slides (with coverslips), all neatly engraved using a diamond-point with brief descriptions and the initials ‘H.C.S.’ and date (Fig. 2). Without doubt, these are the long-lost preparations. Most are conventional microscope slides and it appears that crystalline precipitates from the experiments were collected onto the slides and preserved with a coverslip. The slides are in immaculate condition, with little yellowing of the Canada balsam, and no detachment. Most of them are dated 1852, with a few from later years, up to 1862. There are also ten cavity slides (i.e. with a shallow well), all but one (undated) from 1858. The exact nature of the cavity slide experiments is unclear (see description for Fig. 2B). Most of the chemical precipitate slides precede the year 1855 in which Sorby commenced his research on fluid inclusions. The description on the later cavity slides may indicate that they were used for evaporating the leachates from crushed, fluid inclusion–bearing minerals. Figure 2. Examples of Sorby’s chemical precipitate preparations. Each slide is 40 mm square. (A) Slide 4, a standard side inscribed ‘CaO2CO2 evap at about 70 °F’ and ‘H.C.S. 1852’. This slide contains well-developed rhombohedral crystals (see Fig. 3A). (B) Slide 52, cavity slide inscribed ‘Salts sol. in water in quartz of granite C, Cornwall’ and ‘H.C.S. 1858’. Perhaps this slide contains the remains of an early attempt to investigate fluid inclusions by crushing. Note the deterioration (yellowing) of the Canada balsam in the cavity slide. The engraved notes on the slides are the only source of information about the experiments that generated these products, so we have a tantalising glimpse into the controls on crystallisation that Sorby investigated, without being able to reach any definite conclusions. The notes show that Sorby carried out a greater variety of experiments than described in his brief paper of 1879. As well as evaporating solutions of carbonates, he also added sodium carbonate to calcium chloride or the reverse. We have re-examined the slides using optical microscopy but have not attempted to use any destructive techniques. There appear to be three main types of solid product, sometimes present together (Fig. 3). Many slides contain well-formed single crystals up to 20 µm across and with a rhomb-like morphology and high birefringence (Fig. 3A). In others, the precipitates are in the form of spherulites of highly birefringent radiating fibres with straight extinction (Fig. 3B). Spherulites often form ‘dumbbell shapes’, rather than simple spheres. A few experiments produced acicular crystals, and these invariably coexist with rhombs. (Figs. 3D, 3E). Both the fibres in the spherulites and the acicular carbonate crystals have straight extinction, and are inferred to be aragonite, whereas the rhomb morphology is inferred to be calcite. Without knowing the starting compositions, we cannot be sure if other divalent carbonates may have precipitated, but slides from experiments with Fe-carbonate do show a slight orange discolouration. The experiments that produced only rhombs involved evaporation of calcium bicarbonate solutions generally under mild conditions. In contrast, the precipitates in samples formed from mixing calcium chloride and sodium bicarbonate solutions are spherulites of highly birefringent radiating needles with straight extinction (Fig. 3B). Some experiments produced a mixture of spherulites and rhombs (Fig. 3C), and these are described as deriving from evaporation of carbonate solutions under relatively extreme conditions, including boiling and the addition of MgO and FeO. The experiments which produced distinct acicular crystals coexisting with rhombs (Fig. 3D) also involved relatively intense evaporation and include one experiment in which cotton was provided for the precipitates to grow on (Fig. 3E). Figure 3. Photomicrographs of precipitates from Sorby’s experiments, all taken under crossed polars. (A) Slide 4 (see Fig. 2A), example of coarse rhombohedral crystals, inferred to be calcite. (B) Slide 21, which is inscribed ‘CaCl in exs added to carb amα xFe2O3 present’ and ‘H.C.S. 1852’. 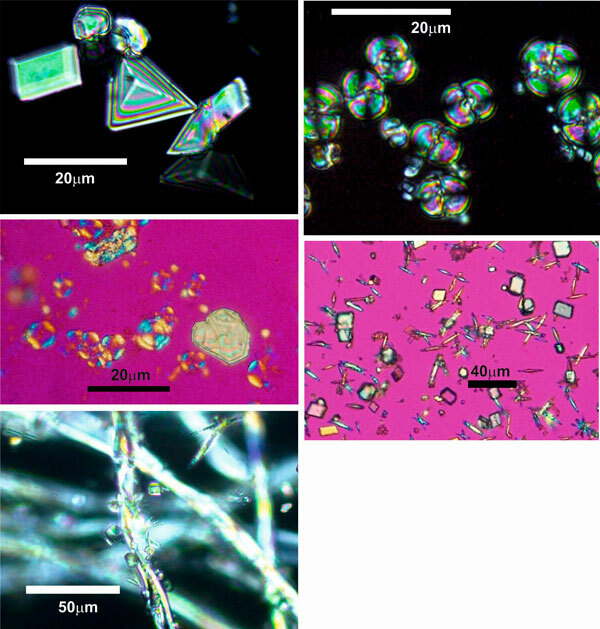 These are examples of spherulites made up of fine needles with straight extinction. (C) Slide 35, inscribed ‘Bicarb. CaO.MgO FeO evap. at 80 °F’ and ‘H.C.S. 1852’. Spherulite textures are represented by very thin, radial growths of fine needles that coexist with much thicker rhombs. (D) Slide 2, inscribed ‘CaCO3 cryst on glass from CaO & CO2 [indecipherable]’ and ‘H.C.S. 1852’. Acicular crystals, commonly twinned, coexisting with rhombs. Crossed polars with sensitive tint plate. (E) Slide 3, inscribed ‘CaO.2CO2 evap. at max. heat & cryst on cotton’ and ‘H.C.S. 1852’. Both acicular crystals and rhombs occur adhering to cotton threads that were added by Sorby as seeds. Sorby noted that crystal morphology sometimes varied according to whether the crystals formed at the surface or the base of the evaporating solution, but he did not provide more details. Some of the slides with mixed morphologies may reflect this phenomenon. In present-day terms, we can infer that spherulitic morphologies are indicative of growth from supersaturated solutions, while single rhombs would suggest a lesser degree of supersaturation. What do we learn from Sorby’s experiments? Are they relevant today? The short answer is that Sorby failed to find answers to the questions he set out to tackle, and, with the benefit of hindsight, it is not difficult to see why. He had no means of identifying his precipitates beyond the microscope, and it would be well into the twentieth century before crystal growth theory was able to provide an adequate framework for his observations. However, what is clear from his 1879 Mineralogical Magazine note is that he had realised that crystallisation can be very strongly dependent on subtle factors which may not appear to be at all significant at the outset. It was lessons like this which led to modern ideas of ‘good scientific practice’ where parameters are controlled to the point where experiments become reproducible. Sorby’s slides give us an intimate glimpse back into the early years of modern science, with a chance to see how an individual scientist was thinking and modifying his ideas while coming to terms with unexpected difficulties in his work. Sorby’s experiments were a failure in their original terms, but not a waste. He bounced back from this frustration to embark on the study of fluid inclusions where he had a lasting impact. Higham N (1963) A Very Scientific Gentleman: The Major Scientific Achievements of Henry Clifton Sorby. Pergamon Press, Oxford, 160pp.